From the awe-inducing Taj Mahal to vibrant artisan villages, India is a tantalising country. And while you can get around by luxurious trains or cruises down the Ganges River, staying overnight at one of the opulent properties by luxury chain Taj Hotels is a must. The locally based company opened up Taj Exotica Resort and Spa in the idyllic archipelago of the Andaman and Nicobar Islands last year and now has another lavish addition to its portfolio. 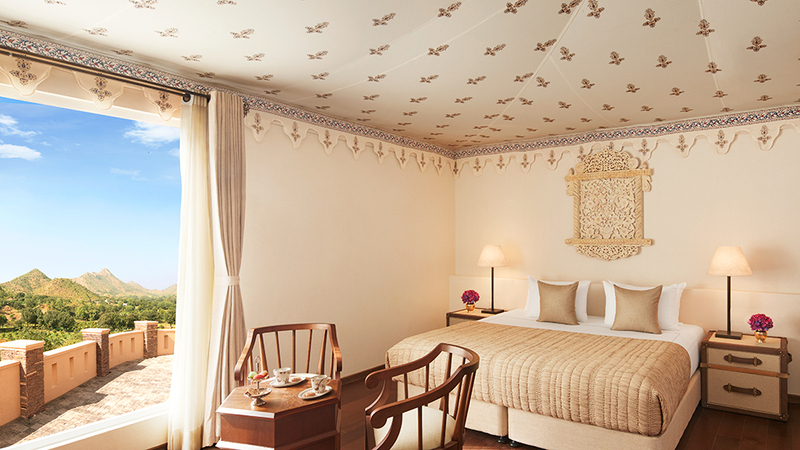 Taj Aravali Resort & Spa, which was unveiled earlier this month, joins the brand’s iconic floating Taj Lake Palace in Udaipur. 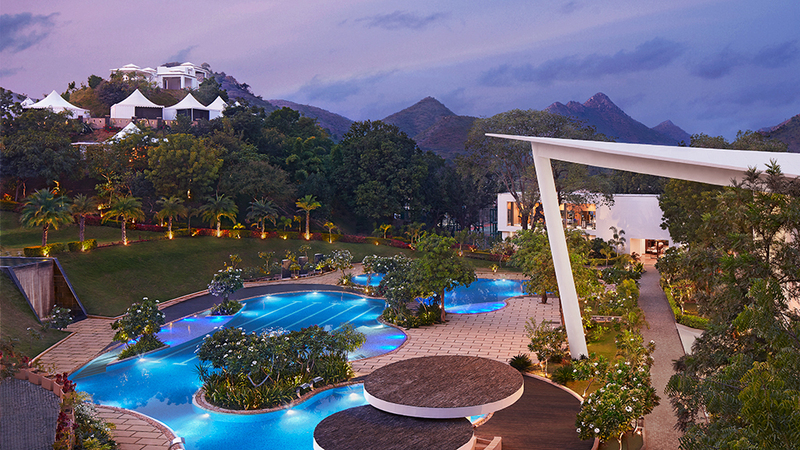 Ensconced in the picturesque Aravali Range, the property serves as the perfect contrast to the bustling metropolis. This year the brand seems to be focusing on mountain resorts that will help guests reconnect with nature and focus on their well-being, with additional hotels arriving in Rishikesh, India’s capital of yoga, and Shimla at the base of the Himalayas in the coming months. At Taj Aravali, which sprawls across 27 acres of verdant, landscaped gardens, there are several outdoor recreational facilities like tennis and basketball courts as well as expansive manicured lawns fit for weddings. Within the resort you’ll find elegantly appointed spaces with a contemporary aesthetic that mixes in traditional Rajasthani elements and details inspired by the Mewar region’s equestrian heritage. When not unwinding at the pool or exploring the city, guests can choose from relaxing at the 1400-square-metre spa, watching a film at the 34-seat movie theatre, or dining at one of the many venues, which include a vegetarian Indian restaurant and an alfresco grill house. All 92 accommodations come with either a balcony or veranda so that guests can relish the surrounding beauty, and options go beyond the traditional hotel room. While there’s nothing wrong with classical quarters lined up side-by-side in elevator-accessed corridors—because there are certainly some extravagant ones—Taj Aravali also offers other lodging alternatives: standalone cottages, each with a sit-out area furnished with a swing, with views of lush gardens; and luxury tents true to the word “glamping,” each with its own en suite shower complete with a skylight and a private garden that can be set up for relaxing breakfasts or romantic candlelit dinners. 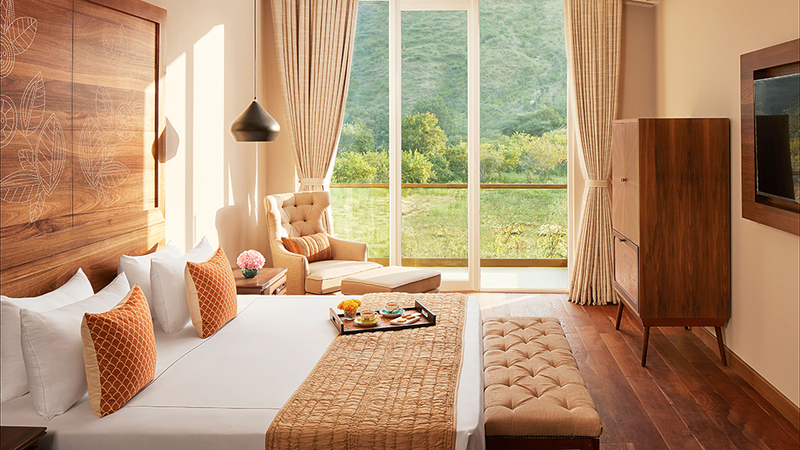 The crown jewel, however, is the 270-square-metre, two-bedroom glass suite that sits atop a hill, providing unhindered views of the Aravali Range. The bi-level accommodation is decked out with Kota stone and Makrana marble and comes with a gym, Jacuzzi, butler pantry, spa treatment bed, private garden, and an outdoor fireplace. Leaving its confines will be a hard pill to swallow.